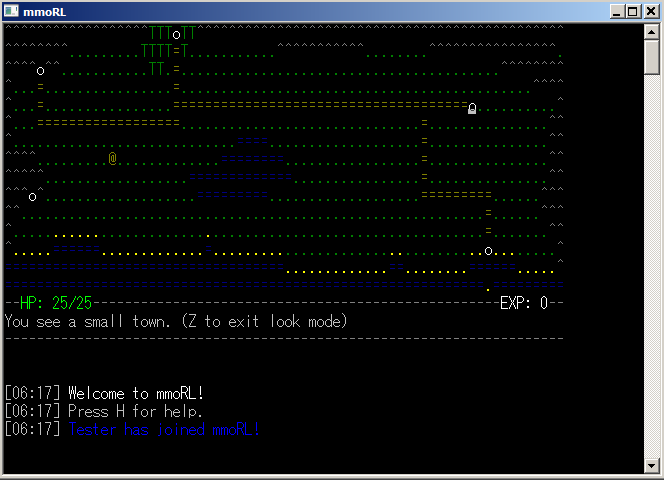 mmoRL is a massively multiplayer online roguelike game. You log in to a central server and play together with other players on the server. The overworld is a safe area and everything there happens in realtime, but the dungeons and other non-safe zones are turn-based and unique per player; you will not find other players in your dungeons. However, in the overworld you can choose to party up with other players, and when you are in a party, you will visit the party leader's dungeons instead of your own - together with the other players in your party. It is strongly recommended you at least read the keybindings and the beginner tips when playing for the first time. mmoRL is public domain under a CC0 license. See here for details. Long story short, you are free to do whatever you want with the game or its code without any obligations. If a letter is capitalized, that means you need to hold SHIFT. -Simply bump into monsters to attack them. 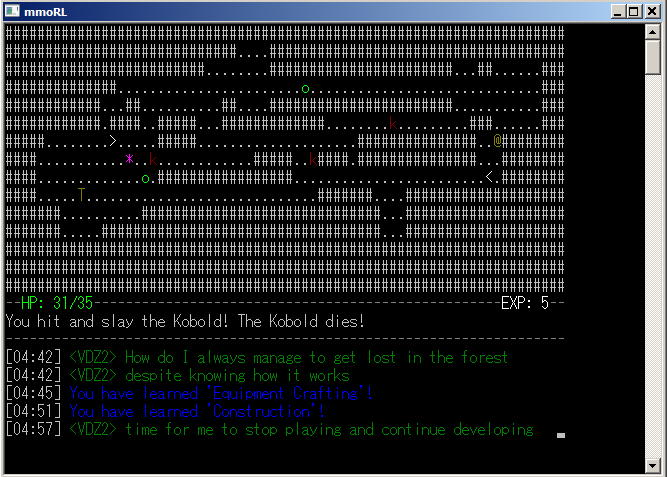 -Contrary to most roguelikes, you do not 'level up' in mmoRL. Instead, you use your experience to learn new skills, which can give you new abilities or raise your stats. -You do not recover HP automatically. Learn either the 'Recovery' or the 'Regeneration' skill in order to restore HP. -If you quit or lose connection, your character remains saved on the server. You'll be able to continue playing from same location you disconnected from by entering the same key again when logging in. However, you will leave the party you are in when you disconnect. -'Safe zones' are areas with no monsters. They are not turn-based but realtime, in contrast to non-safe zones. -Death is permanent in this game. Try not to die. -Magic is a useful crafting component. Don't use all of it for extra experience. -Before you can learn a skill you must first discover it by using a symbol item. These can usually be obtained through crafting. The list of recipes give the recipes for some basic symbols. -The forest is a safe area where you can gather some resources. Be careful not to get lost, though. -Some resources are gathered by destroying objects using the Destruction skill. For example, destroy a tree to get wood. -To the east you can find the town. When entering it, you type a town key, and get transported to the (initially empty) area for that key. As these areas are permanent and shared among all players who know the key, you can use these areas to store stuff (for if you die), share things with friends or just to build stuff. A public area is available using the town key 'public'. -Don't try to solo a dragon. You WILL die. Not all skills are listed here, and not all details are listed for each skill. You'll have to figure out the rest on your own! Heal back to 25 HP when entering a safe area. Heal 1 HP every turn. Has no effect in safe areas. Allows you to craft items. Many items will require additional skills to craft, however. Raises your maximum HP by 10. Allows you to destroy objects. You are unable to destroy objects in certain areas, and some objects are indestructible. Destroying certain objects such as rocks or trees will net you resources such as stones and wood. Allows you to craft and place floors and walls. Note that you are unable to build in certain areas, and you cannot build over indestructible objects such as stairs and entrances. Allows you to craft equipment, such as armor and weapons. Allows you to create items from magic. Allows you to craft leather items. Some basic recipes. There are many more in the game than just those listed here. Allows you to learn the skill 'Toughness'. Allows you to learn the skill 'Destruction'. Allows you to learn the skill 'Construction'. A very basic weapon. Gives +1 strength. Allows you to learn the skill 'Equipment Crafting'. Armor made from Kobold Scales. Gives +1 armor. A full list of obtainable items in the game. Some must be crafted, others must be found.